Now that I am back from France and catching up with my friends, the question that I keep getting asked about my trip is inevitably: “What was the most memorable moment of your tour?” What a difficult question to answer! There were so many important and emotional moments. 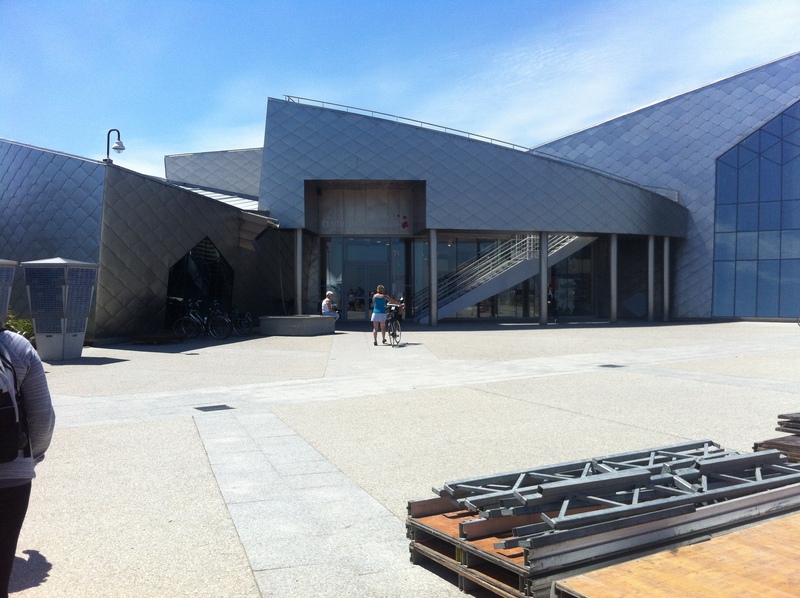 However, the moment that really brought everything home to me took place in the Juno Beach Centre. I should preface this memory, however, with a short back-story. When I received an email about the Canadian Battlefields Foundation tour from my university, I was immediately interested and began the application process. I was overjoyed to hear a few weeks later that I’d been accepted on the tour. I welcomed the chance to have the opportunity to learn about history on the very soil these battles were fought and so to see firsthand the places I had only heard about in history books and in history class. As a recent graduate of Bishop’s University with a B.A. in Social Science and a B.Ed. in Secondary Education, it was clear to me that this trip had the potential to greatly impact my teaching philosophy and instructional approach. As a future history teacher, I think it is my responsibility to explore course content in depth and to do my best to make my lessons as engaging for my students as possible. Ideally, the preparation for these lessons involves both first- and second-hand research of the sites themselves and the variety of experiences associated with the stories being told. This process allows me to develop a genuine connection to, and a great enthusiasm for, the material being covered in my classroom. As the World Wars are (at this moment in time) barely covered in the Quebec history curriculum, I feel compelled to rectify this ridiculous omission and make sure that this important part of our history, and the lessons learned from it, are passed on to Canadian youth. There was also, however, a more personal reason behind my interest in this tour. My late Grandpa, Ralph Bowles, and my late Papa, Eric Cowan, both participated in the Second World War, as did many of their male relatives. My Papa was also present at the landing on Juno Beach on D-Day. Unsurprisingly, neither of my grandfathers liked to speak about their experiences. 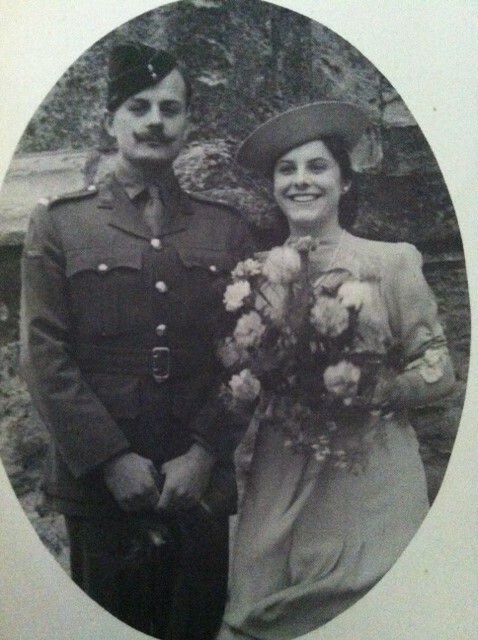 I should also mention that my Nana (Papa’s wife) was a war bride from Britain. WW2 had such an important impact on the evolution of my family that I very much wanted to learn more about the experiences of my grandparents. The second to last scene of this film involved images of soldiers going about their business prior to the D-Day landing or in quiet moments between actions. There were soldiers shaving each other’s heads. There were groups of soldiers sitting or standing together and smiling. As we looked at these photos, men gradually began to fade away, until only a few remained. These were the ones who had survived the D-Day landing and the subsequent battles leading to the end of the war. For some reason, this visual struck me to the core. These young men who moments ago had been smiling, whole individuals had suddenly disappeared. I had so many questions darting around in my mind: Did they suspect that they were going to die? What were their dreams and aspirations? 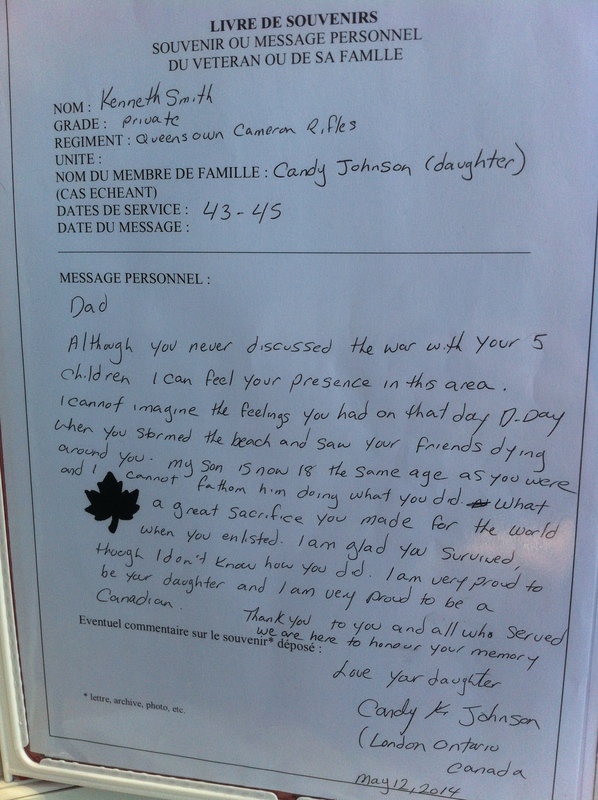 What would they have said to their loved ones back home, if they had had the chance to say goodbye? What advice would they have given to other young men thinking of joining up? Did they regret their own choice to go to war? I could no longer hold my emotions in. I knew that at some point during my trip that the enormity of lives lost and potential wasted would really hit me. All the graves in the numerous cemeteries that we’d visited were those of real people, who had families and goals, were mourned and unable to achieve their ambitions. How did their loved ones get on with their lives after their passing? How would I have been able to cope if my boyfriend/father/brother/etc. died? How did my grandfathers manage to escape this fate? It is so strange to think how close my relatives and I came to not existing. As I watched these images on the screen, tears started rolling down my face and sobs escaped my mouth. I felt the hands of my tour mates reach out in the dark to comfort me. 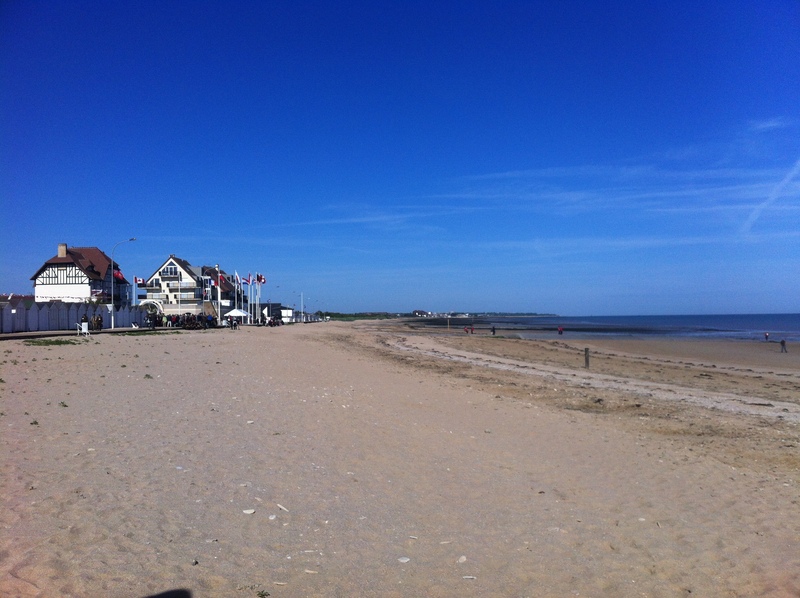 The last scene of the video involved a family of Canadians walking along Juno Beach. The mother turns to her son and daughter and asks them if they know where they are and what happened there. 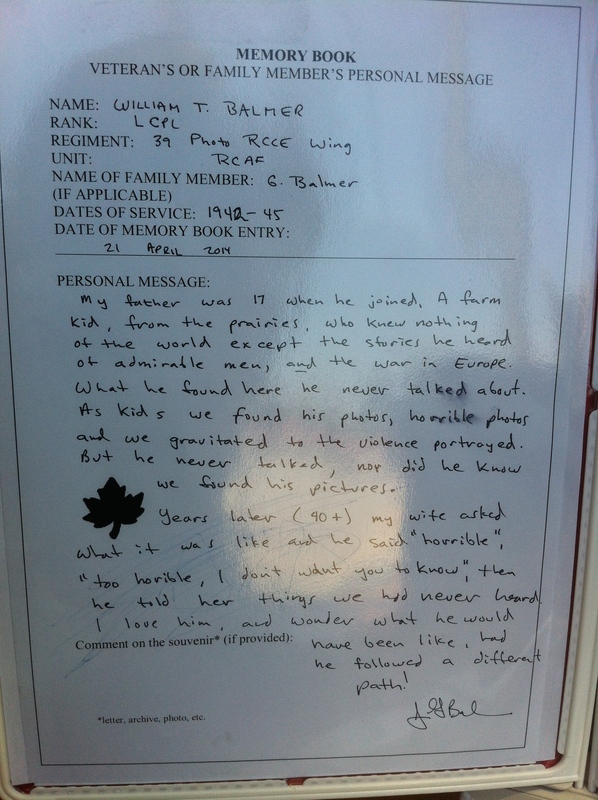 As the children begin to tell their parents what they know and the family walks further along the beach, the ghosts of Canadian soldiers follow behind. 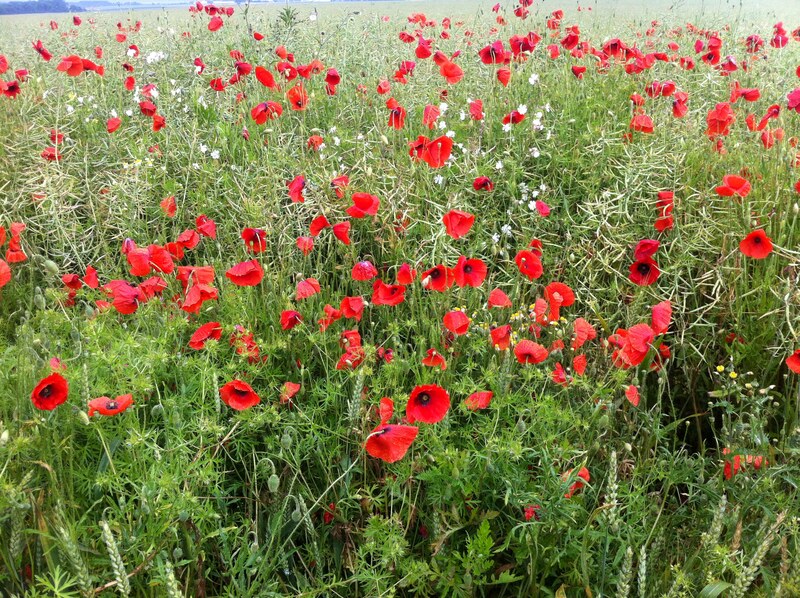 To me, they represented not just the spirits of those who gave their lives in the name of freedom but also hope for a better nation and a better world. After watching the video, I needed some time to myself to process what I had witnessed. 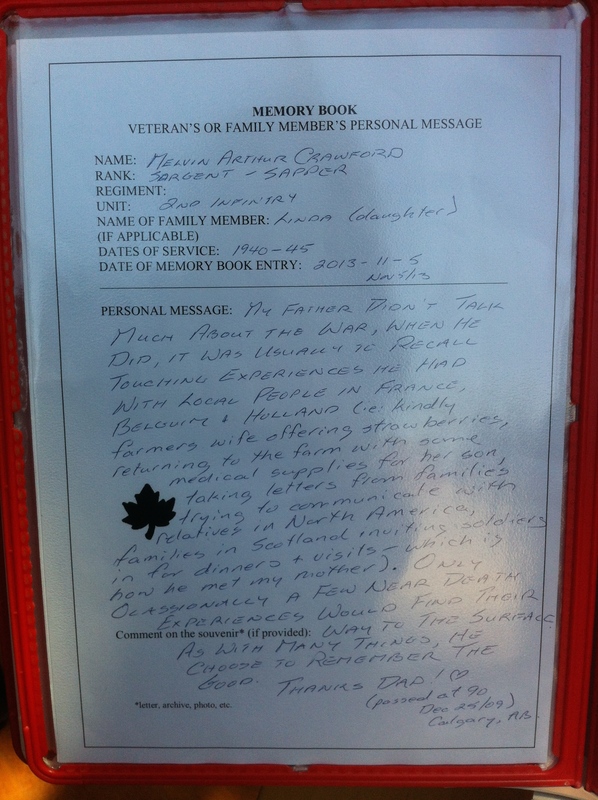 I sat quietly in a corner of the last exhibit, and found in front of me a “memory book” for veterans and their families to record messages in. (I’ve included a few excerpts here for you to read.) 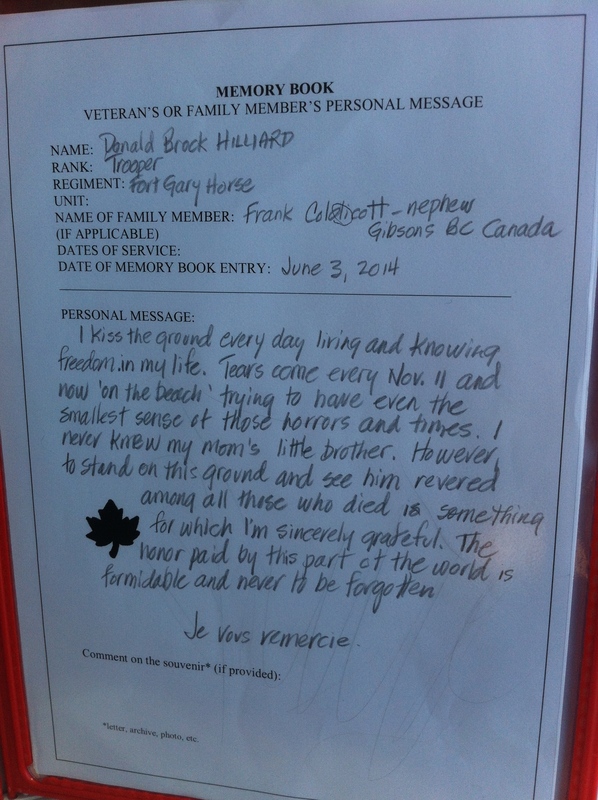 Some of them were incredibly touching, and helped to give me a sense of our collective Canadian strength and love. We are the product of all of our history. Everything that has happened to our ancestors and to our country has in some way shaped the world we live in and the people we have become – and are becoming. The soldiers who died fighting in the Second World War are part of this history, and their memory and sacrifice must not be forgotten. Our young people must be given the chance to learn about the events and the people who have influenced our future. 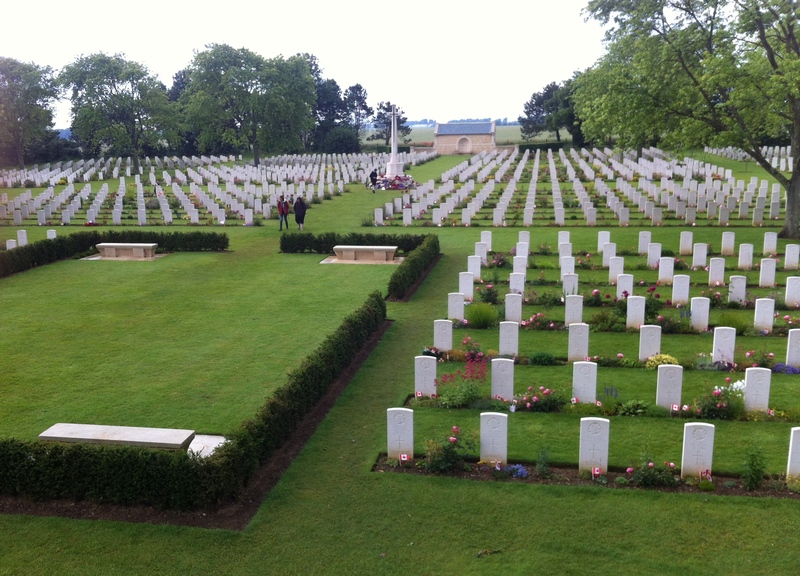 In late April when I told my Papa that I would be travelling to Normandy in June to learn about the Canadian experience in WW2, he said that he looked forward to hearing all about it when I got back. As he was quite ill at this time, I knew that this was unlikely to happen. He passed away in early May before I left for the trip. I am heartbroken that I won’t get to talk to him about the stories I heard or ask him all the questions that the trip sparked in my mind. 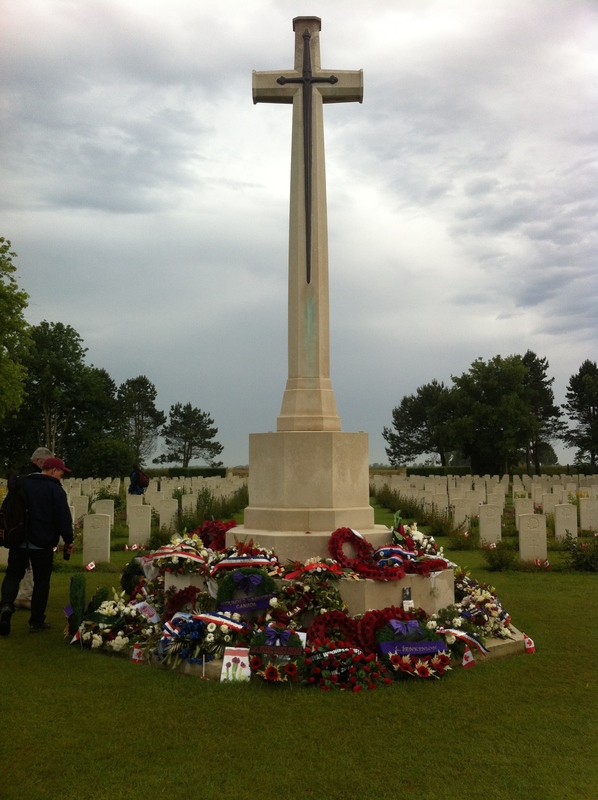 But I am so thankful to have had this experience and to learn more about what thousands of young Canadian men died for, fought to protect, and lived through. These are the lessons that I hope to pass on to my future students.